In their second exhibition with Johansson Projects, entitled All Exit, Jennifer and Kevin McCoy present new works that spin out from the landscape of the Californian west, from farmland to corporate campus. California, with its nexus of computer, entertainment, and military industrial centers is seen as the conclusion, both geographically and ideologically, of the frontier fantasy of the American dream. The title, All Exit, is taken from internet rhetoric in which Silicon Valley scions write about moving beyond California to create new, legislatively permissive, zones of privilege. In these new projects, constructed as wall-mounted dioramas, the McCoys present elaborate fabrications that extend from the physical nerve centers of the tech headquarters to the imaginary landscape of board game fiction. Employing exhaustive categorization, recreation, automation, miniaturization, and remote viewing, the McCoys create kinetic, multi-media, multi-faceted sculptures. Installations ranging from miniature dioramas to all encompassing environments invite the viewer to see sculpture, camera, and screen as one in the production of live experience. In the installation, Priests of the Temple, (2012) an office building juts out of a Mt. Rushmore-style mountain. The embedded video incorporates found images from a Silicon Valley hotel spa. Behind the building, a portrait of Intel co-founder Gordon Moore looms like a Pyongyang mural. Also on view, Between the Resorts depicts a no man’s land between a simulated ski slope and a simulated water park. Embedded video shows images of sand blowing across pavement, an echo of the natural environment that has been obscured. 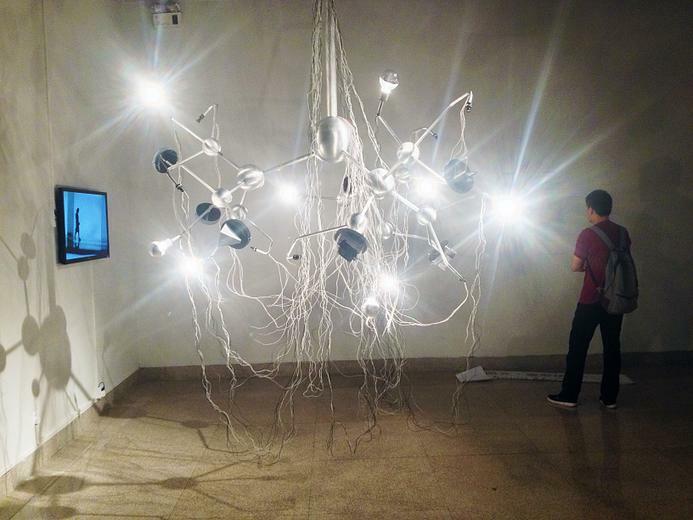 The Constant World 2014, built of ceiling mounted metal spheres, models, cameras, and lights, features sound and evolving video playback. The piece presents a utopian world that acts as its own advertisement. Individual miniature film sets, when filmed live and sequenced on a large screen, portray a film noir psycho-drama. 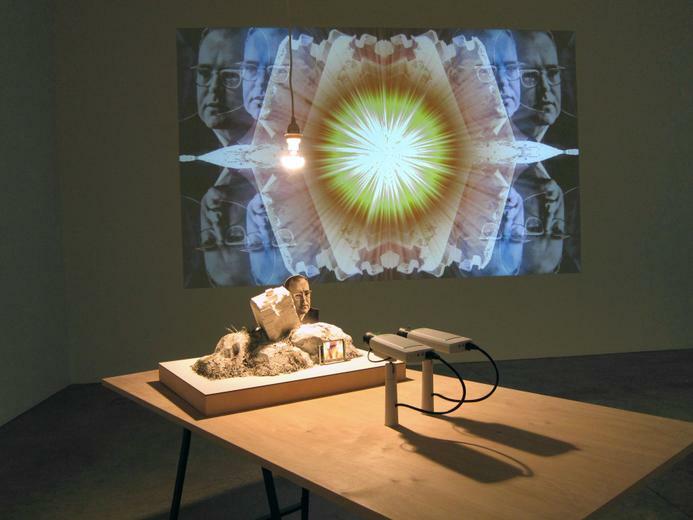 The resulting video beckons the viewer to inhabit the sculptural space, becoming a part of the piece physically and on screen; the viewer becomes an inhabitant of the piece – actively attributing and interpreting meaning. Jennifer and Kevin McCoy have been exhibited at The Metropolitan Museum of Art, P.S.1, The Museum of Modern Art, The New Museum, and SmackMellon. International exhibitions include projects at the Pompidou Center, the British Film Institute, ZKM, the Hanover Kunstverien, the Bonn Kunstverein, and F.A.C.T. (Liverpool, UK). Grants include a 2002 Creative Capital Grant for Emerging Fields, a 2005 Wired Rave Award, a 2011 Guggenheim Fellowship, and a 2014 Alumni New Works grant from the Headlands Center for the Arts which made some of the works in this exhibition possible. Articles about their work have appeared in Art in America, Artforum, Flash Art, Art News, The New York Times, and Newsweek. 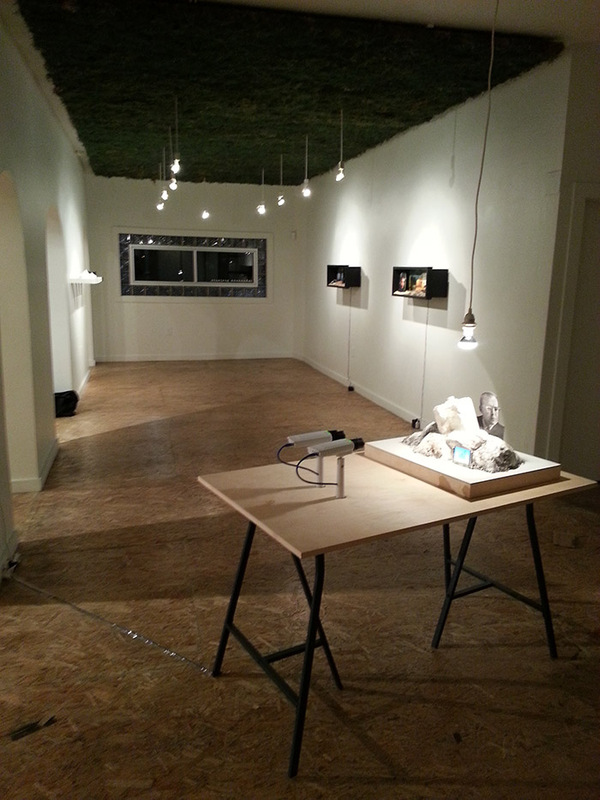 Residencies include work at the Headlands Center for the Arts, and the Lower Manhattan Cultural Council. Their work is in collections at the Museum of Modern Art, The Metropolitan Museum of Art, the Milwaukee Art Museum, and MUDAM in Luxembourg. jennifer + kevin mccoy // Dominion - Wall mounted shadow box depicting a fantasy landscape incorporating aspects of the San Francisco Bay area, the Dominion board game, and the Oracle headquarters circa 2014. Contains an oil on canvas background, color photography, video screen, and electronics. 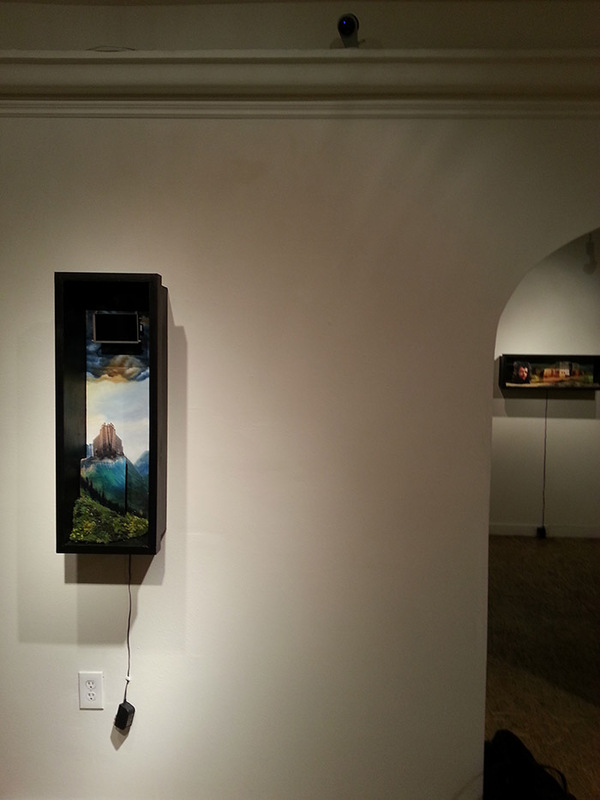 ; 30" x 9.5" x 9"
jennifer + kevin mccoy // Shore Leave - Wall mounted shadow box depicting a fantasy landscape incorporating aspects of the San Francisco Bay area, the Forbidden Island board game, and the Paypal/Ebay headquarters circa 2014. Contains an oil on canvas background, color photography and electronics. 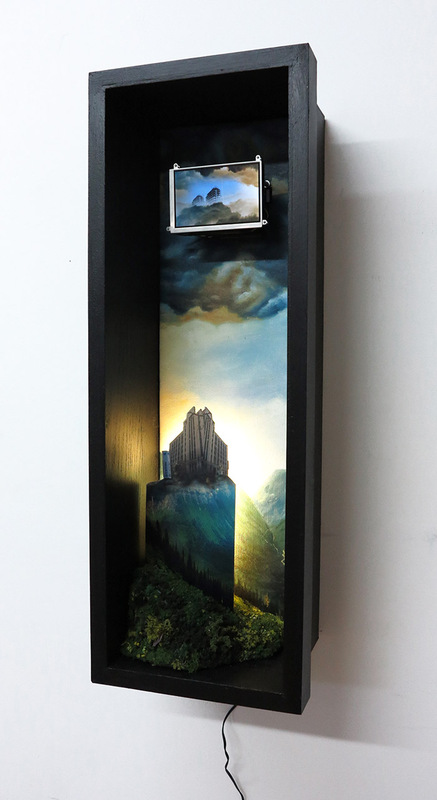 ; 30" x 9.5" x 9"
jennifer + kevin mccoy // Aerie - Wall mounted shadow box depicting a fantasy landscape incorporating aspects of the San Francisco Bay area, Lord of the Rings, and the Twitter headquarters circa 2014. 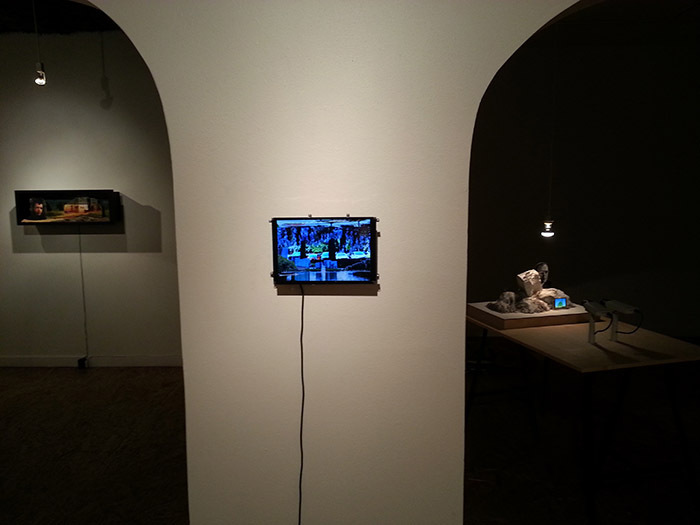 Contains an oil on canvas background, color photography, video screen, and electronics. 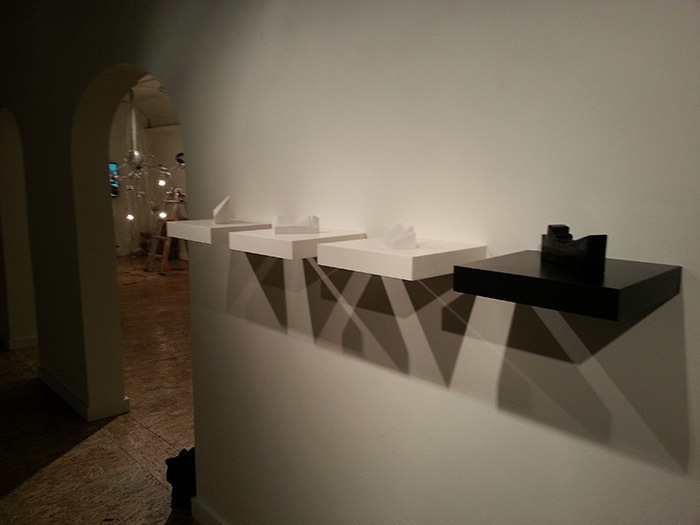 ; 9.5" x 30" x 9"
jennifer + kevin mccoy // Between The Resorts - Sculpture with electronics. Between the Resorts depicts a no mans land between a simulated ski slope and a simulated water park. Embedded video shows images of sand blowing across pavement. 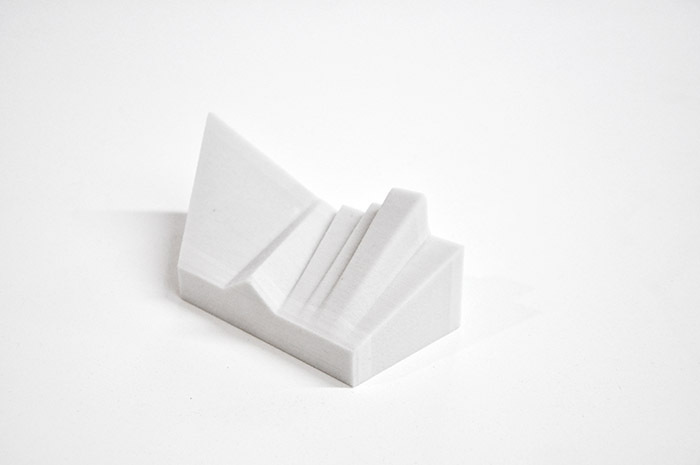 ; 11" x 16" x 20"
jennifer + kevin mccoy // EICHLERGOOGLE - This 3D printed, sandstone sculpture fuses an extruded image of the Google headquarters with the architecture of a middle class Joseph Eichler subdivision home. ; 5" x 2" x 2.5"